164 pages | 10 B/W Illus. According to the Food and Agriculture Organization (FAO) of the United Nations, more than 80% of world’s fish stocks are fully exploited, over-exploited, depleted, or recovering from depletion. Although several international agreements have promoted more responsible fisheries, coastal states have usually maintained national policies that enable higher harvest levels rather than greater conservation of fish stocks, and international agreements for more responsible fisheries have generally experienced a weak domestic implementation. 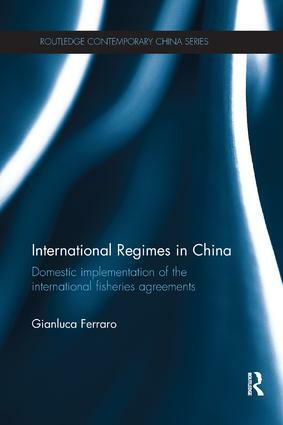 Among the major coastal fishing states, China constitutes the largest fish producer and main exporter in the world, and therefore presents a fascinating case-study for the domestic implementation of international fisheries agreements. This book investigates the degree to which China has complied with the international agreements it has signed, and asks why it is failing to meet expectations. Crucially, it calls for greater emphasis on the political, rather than technical, issues involved in the implementation of international regimes. In turn, it examines how understanding the case of China can help us to develop solutions for improved international compliance in the future. Providing an improved understanding of the implementation of international regimes, alongside an in-depth study of China’s political system, policy-making and compliance, this book will be of great interest to students and scholars of Chinese studies, international relations, public policy, and international law and environmental studies. It will also be useful for policy makers working in the fields of environmental regulation and fisheries management. Gianluca Ferraro is policy analyst at the European Commission. His work focuses on policy implementation and environmental governance and he holds a PhD in Public Policy.